Below you will find a series of questions and answers that will help you familiarize yourself with our site. Join HobbyClassified.com is fast and free. IMPORTANT : You will receive a message to this email address so that you can confirm your registration. Make sure it is valid and that you access them now. Within 24 hours if you do not confirm your registration, you must re-register. How do I change my personal information and my profile? You must first login. To do this, press the button « LOGIN » and enter your username and password. You will be redirected automatically on your personal page. You can then press the link « MY ACCOUNT INFORMATION ». You can make any desired changes and confirm your new information. HOW MUCH IS THE REGISTRATION ON HOBBYCLASSIFIED.COM? Nothing. Registration is completely free for advertisers and users. Press the button "Edit My info"
Press the button "Save settings"
THERE YOU GO! YOUR NEW PASSWORD HAS BEEN CHANGED. On HobbyClassified.com, members buy, sell and trade their items in usability, but also the reliability and security. That is why it is important for you that your account is verified. It is through this that we will be able to ensure your identity and address to other members . To enjoy these benefits, please visit the page « Verified Member ». POST AN AD OR AUCTION? Why post an ad or an auction? The ads are a quick and easy way to sell an item, especially if you know its value. There is no fee for the sale. Auctions are great if you do not know the value of an item. They are also very exciting for all buyers. For a limited time, the costs are free for the auction. How to post an Ad or an auction? You must first become a member to post an ad. Join HobbyClassified.com is fast and free. Simply fill the registration form by pressing the button « Register » and then confirm your registration by clicking the link that will be sent to your email address. You will be able to Edit, Delete and preview your ad before submitting it. Is there a delay before my ad appears on the site? Your ad will be verified in a short time. This delay allows the customer service to ensure that your ad meets the eligibility criteria. How do I know if my ad is active on the site? You can see your ad in the "My Ads" section in the menu My Account.You must « Login » to access this section. The section « My Ads » gives you an overview of all your ads and actions you can take. You will be informed about the status of your ads. If it is not there, you are perhaps awaiting approval. How to quickly find my ad? To quickly find your ads and auctions, go to the menu section « My Ads ». You will see all listingss that you have added to the site. Also you can search your listing with its ID using the search field in the menu. Changing your ads is one of the services that HobbyClassified.com is proud to offer to its members. You can change at any time "category, information, photos, videos and Twitter user name" your ad online during the time of publication. In Section « My Ads », personal page management of your ads, click the edit icon and follow the steps provided. If you are «Verified Member », Your ad will be activated immediately. HobbyClassified.com is proud to offer to its members the Ads renewal service . You can renew your own Ad in section « My Ads -> My Expired Listings ». Click on Renew button . Your ad will be instantly renewed for the period that you specify. After 15 days of due date, the ads are not renewable. I Sold my item , what should I do? You can Tag your Ad Sold in section « My Ads », in your personnal page Managementl. Click on Icon . Your ad will be visible on the site for a period of 2 weeks, and the word « Sold »will be instantly added to your online ad. Note that when an ad is sold, removed, or reached the end, the additional credit options ends and does not apply to another Ad. Please note that customer service can resume an ad. I sold my item after a bid, what should I do? If your bid has been sold, the winner will receive an email to mention that he won the auction. 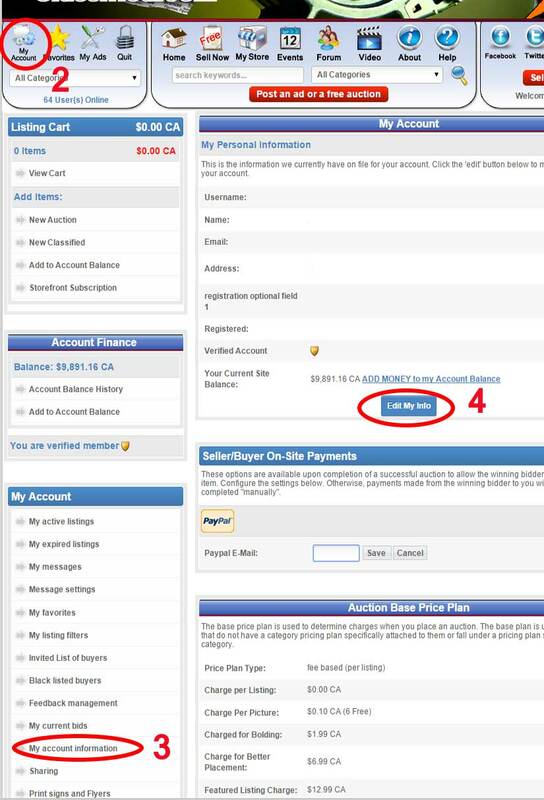 If you have enabled Paypal when adding an auction, the buyer can pay you in your Paypal account using the link that will be emailed. If you do not enable the payment by Paypal, you should contact the buyer to submit your payment terms. The link of the auction will remain active for a period of 30 days.
. You can Tag your ad Sold in section « My Ads », personal page management of your Ads. Click the icon . Your ad will be visible on the site for a period of 2 weeks, but the word "Sold" will be instantly added to your online ad. Note that when an ad is sold, removed, or end, the additional credit options ends and does not apply to another ad. Can I remove my Ad myself? You can delete your own ad in section « My Ads », managing personal page of your Ads. Click on icon . Your ad will be instantly removed from HobbyClassified.com. Can I know the statistics of my ads? We built a statistical tool on HobbyClassified.com. This tool allows you to view the number of times your ad has been accessed and the number of questions / comments sent and received by users of the site. If you have an item for auction, you can see the highest offer. How to add or edit a photo to my ad? You can add a photo to your ad in section « My Account -> My Active Ads », management page of your ads. Click the Edit icon under the ad you want to edit. Press the link « Edit Media » and carefully follow the steps provided in Help for adding your photo. Please note that we do not make any corrections to received photos. The maximum size allowed for photos is 5Mb. Do not send large files unnecessarily. The large files may be automatically rejected. Accepted formats are jpeg, png, gif, tiff and bmp. How to add or edit a video to my ad? You can associate a YouTube video in your ad in section « My Account -> My Active Ads », management page of your ads. Click the Edit icon under the ad you want to edit. Press the link « Edit Media » and carefully follow the steps provided in Help for adding your video. How many pictures can I add to my ad? You can add up to 10 photos for each ad that you published. The first 6 photos are free of charge. A slight extra cost will be charged for additional photos added. What is the Bump Up option? Bumping up your Ad will reset the post date of your ad to the time of the bump, thus moving your ad from its current position in the listings back up to the top of the first page, just below any ads in the Featured Ads and just below the Privileges ads on the first page in its class. It will remain in that spot until any other Ads are posted in the category, at which point it will move down accordingly in the listings. It will not extend the life of your Ad. Position in top of the listings depends directly on the number of ads posted by other users. This option allows you to put your ad above the top of the list without having to recreate it completely. The Ads that appear on the first page enjoy greater visibility and therefore generate more responses from clients or potential buyers. However, the visibility remains lower than a Featured Ad or Privilege Ads. According to our statistics, a Featured Ads is seen five times more than a regular ad. The impact of this option is the immediate visibility of your Ad. What is the difference between the Bump Up option and Featured Ad? Bumping up your ad will move the ad from its current position in the listings back up to the top of the listings on the first page, just below any Provilege Ads. It will remain there until other ads are posted in the category, at which point the ad will move down in the listings. In other words, bumps will reset the posting date, so your ad will appear to have been posted at the time of the bump up. Featured Ads are ads which appear in main page and the section at the top of a category listing page for the duration of the listing. These ads rotate through the various pages in their category in the top section of each page, for increased and equal exposure for all the Top Ads in the category. Because Featured Ads last for the duration of the listing. They cost more than a bump up, but result in more exposure, and therefore generally more visitors and replies to your ad. Sometimes an ad is not enough. In some cases, you want to stand out from other ads. Extra Options These make your ads more attractive! The Extra options allow you to increase the visibility and promote your ads. The duration of additional options is the same period as your ad. A User Fees is applicable for extra options that you apply. Extra options can be applied in two ways on your ads. « Login », go to the section « My Ads » in Menu. Press on the icon . Select the extra option of your choice. The « Urgent Ads » option, are Ads where the seller has indicated that they want to sell their item quickly. Ads with the urgent icon stand out from all others in a category because of their different look: and a yellow background with a Bold character. This gives more visibility compared to other ads and allows you to have more visits and responses. "Top Ads"will show your ad at the top of the list and the selected main category until the end of the end. It will be in rotation with other ads that have the "Top Ads" option. It will be more easily identified by users of the site. The publication of a Featured Listing can sell faster and / or be much more visible on the site because you are at the top of the home page. These ads have a position of choice on the first page. They are seen first, so there are more people who see your ad, the more they respond. Featured Ads will be displayed in rotation while appearing in his regular category. "Attention Getter" appears on your ad while users browse categories. It helps to bring extra attention to your ad. Otherwise your ad could be neglected. Link to your website maximize your visibility by providing an alternative method of contact. It provides a complementary form of advertising on your product or service. Thus directing traffic to your web page which contains more photos and description of the item or service you offer. How to add a link on a new ad?? If you want to add a link to your ad, you must enter your web address in the "Link from your site" when you create your ad. How to add a link on an existing ad?? The first step is completed, passed on to the next step. Check the box "Your Website URL" if it is not checked! Press the button "Next Step"
The Link of your website should appear in your ad, however, remember that you can not use your ad for the sole purpose of redirecting Internet traffic to your website. The link of your website should be an additional element of your ad. CAN I ADD A LINK FROM MY WEBSITE IN MY AD? Providing additional information about your product or service. Directing traffic to your custom page that contains more photos and description of the item or service you offer. Providing a complementary form of advertising. 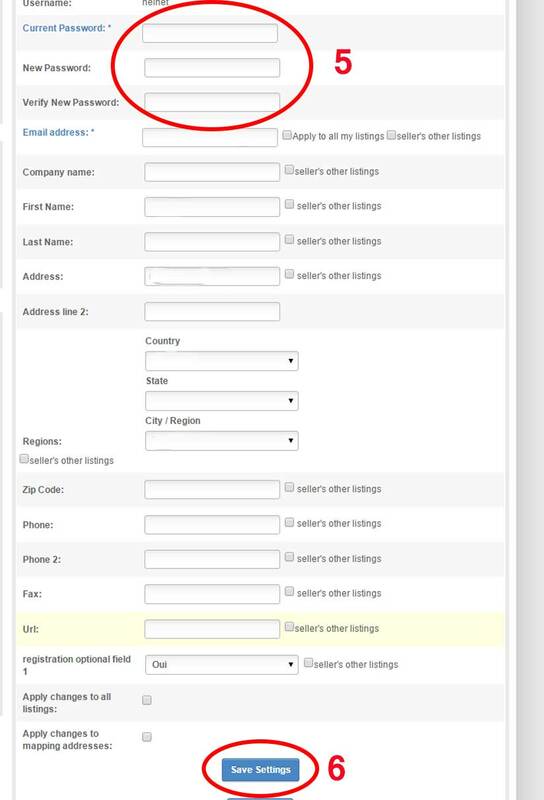 If you want to add a link, you must enter your web address in the field "Your Website URL" when you create your ad. Some fees will be charged. However, remember that you can not use your ad for the sole purpose of redirecting Internet traffic to your website. The link of your website should be an additional element of your ad. I FORGOT MY USERNAME AND MY PASSWORD! Click on the link «I forgot my password » in the menu. You must then specify the email address you provided when you registered and we will send you an email with your username and password. Publishing ads is completely free. However, we offer EXTRA options to enhance the visibility of your ads. You can find more information here. There is also an overview of possible costs related to your ads on the page "My Account". HOW TO FIND WHAT I'M LOOKING FOR? A quick search bar is available at the top of every page of our site. It allows to search by keywords, categories and regions. A module of Advanced searching is available at the bottom of the page if you want to search by more specific criteria. You can also navigate through categories that are listed on our home page. CAN I STORE ADS FOR REVIEW LATER? Yes! You can create a Favorites list in section "My Account". You must« Login » first. Each Ad on our site has a link "Add to Favorites". Just click on this link and the ad will be added to your list of favorites. All payments for sold items on this site are done between sellers and buyers. It is strongly suggested to meet in person the buyer or seller to complete the transaction directly. HobbyClassified.com not involved in the transaction or payment. Never send money or do not transfer to the seller. To pay the fee for extra options, Verified User and add and accout balance, you can use Paypal. The Account Balance allows you to pay the charges for extral options (Featured Listings, Better placement, Attention Getter, Urgent highlighting etc...) The use of Account Balance can reduce the cost of your transactions. You can add at any time the amount you wish to your Account Balance. I GOT A DISCOUNT CODE: HOW CAN I USE IT? A Discount Code is a code allowing you to get immediate discounts on our Extra Options. These codes can be applied while billing. To use them, you must first become a member. Join HobbyClassified.com is fast and free. You simply fill out the Registration form and then confirm your subscription by clicking the link that will be sent to your email address. You can enter your discount code in your Cart and the discount will be automatically applied. The discount code may be for a limited time. WHAT CAN I DO IF I DO NOT FIND WHAT I'M LOOKING FOR? You can create alerts in the "My Account". Our system automatically searches all new listings that match your criteria and you will receive an email notification whenever a listing matching your alert. You can post an ad in category "Wanted" and enter what you are looking for. Our system allows you to create signss and flyers for your ads. Simply select the ads you want. Then click the button to generate your signs or flyer. The tools « My Alerts » allows you to be quickly notified of new listings posted on the site. Alerts allow you to filter the ads as and when they are published. You will be informed by email as soon as ad published meets your criteria. The option « My Favorites » allows the member to maintain the list of ads he wishes to consult again in the near future. This option is available only to members who are logged. All Ads that ended or deleted will be automatically removed from your favorites. How do I add ads to My Favorites? By clicking this link, the page « My Favorites List » will be displayed and the Ad will be add to the list. How can I see My Favorites? By clicking on the "My Favorites" link on the menu at the top of each page, you can access the list of your favorite ads. Note that the listings are shown in order from end to the first ad . Also note that only the last 100 ads selected are displayed. How do I remove ads in My Favorites? To remove ads from your favorites, simply go to the My Favorites via the My Account menu and then press the "Clear Favorite" against each ad button. Note that all ads that are completed or deleted will be automatically removed from your favorites. The tools « My Messages » in section « My Account », allows you to communicate with the users of HobbyClassified.com. How to answer the messages? Message settings allow you to choose the method of communication by email. If you choose public method, your email will appear in your messages. If you choose the private method, your email will be confidential and you must use our secure messaging system. Our auction system, offers the opportunity to invite or refuse a user to participate in your auctions. The other site visitors will not be allowed to participate in your auctions. All users will be allowed to participate in the auction except the users you have added to the list. Warning! the above options will be applied on all your auctions. HOW CUSTOMERS CAN CONTACT EACH OTHER? We offer to users to contact the advertiser via email using a form available on each ad. The advertiser receives an email which it can respond either by email or via our internal messaging system. If he wishes to preserve his anonymity, the advertiser may choose not to reveal their email address to other users. For different reasons it is possible that you have trouble communicating with another user of our website. The information listed in the ad description could be faulty or ad could not be active on the site. If this is the case, you will understand that for reasons of confidentiality, we can not give any further information than specified in the description of the ad. If the ad you want to view is expired and no longer appears on the website, we will abide by these measures. For all inquiries regarding the banners or any other form of advertising offers HobbyAnnnonces.com our site, please Contact Us. HobbyClassified Storefront are completely free and allows sellers to develop their activity on HobbyClassified and the Internet. With HobbyClassified Storefront, you can view all your ads, regardless of their format a single convenient location. You can create and customize your own Storefront HobbyClassified. Your contacts will go directly into your Storefront with a unique URL. You can access a variety of tools to create, manage and track your activities. Storefront is your store on our site. It offers a set of pages and category changed according to your requirements and needs. Show your Storefront Ad that you published online on HobbyClassified website. Sort listings of your Storefront in your own categories. Display your Logo to symbolize the visual identity of your business. Kept in touch directly via the link Contact and form of your Storefront. Send Promotionnal emails to your customers through their subscription to the Newsletter of your Storefront. View statistics of your attendance through the Storefront module, daily monthly and annual statistics (until 3 years). Locate your location to your prospects and potential buyers through the Geolocation plan of Google Maps available in your Storefront. Finally, to show visitors that you are a true "Professional" with your custom Storefront! If you have not found an answer to your question in one of the above items or if you would like to report a technical problem, please send a request by using our contact form. Do not forget to indicate the subject of your request and your username or ad ID for which you request information, if applicable. You still can not find the answer to your question?